How does my anxiety impact me and how do I express these emotions through my work? 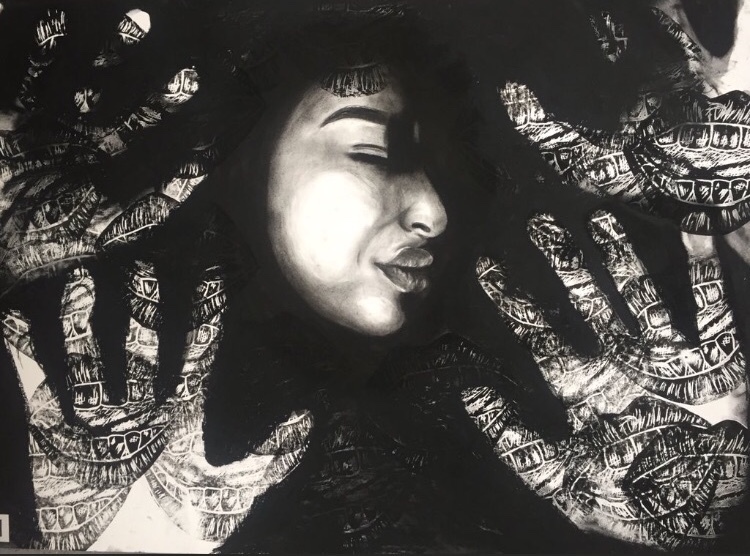 I have based my creative piece around portraiture, specifically focusing on how hands can be used in conjuction with the face to express the condition of claustrophobia. I have chosen the theme of mental health, specifically claustrophobia to try and support my own personal development, improving my own self-effacing personality which can sometimes hold back my confidence. I am also influenced by how anxiety can cause the feeling of entrapment and prevent people from progressing with their life. I wanted to experiment with a range of media handling and techniques which focuses on how portraiture could be used to narrate the sensation of feeling trapped in one’s emotions through this theme. I was heavily inspired by the work of the Danish self-taught artist Henrik Uldalen. Uldalen’s work inspired me through his focus of pessimism, longing and loneliness which he depicted in direct contrast with his subject matters fragile beauty. He has developed dream like compositions which narrate emotions such as entrapment. He focuses on mood and atmosphere as starting points in his portraits which leaves the viewer feeling empathy for his subject matter. This influenced how I tackled mood and atmosphere in my own work and how I experimented with layout in my development of composition. Are the most influential characters those we avoid most? Is an idea ever truly original?